It seems like there are a lot of Korean restaurants opening up in Edmonton lately! I'm not complaining though, as I love having a wider variety of restaurants to choose from when dining out. 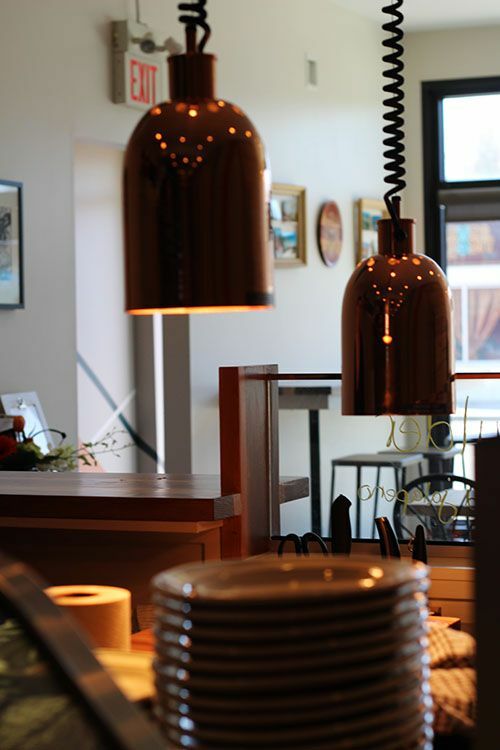 The latest to open is Nongbu, located right in the heart of Old Strathcona. Located off Whyte Avenue next door to Choklat, Nongbu is a two storey Korean restaurant serving up small plates and a few bigger sharing dishes. A small menu of Korean snacks and street eats, fresh hand-cut noodles, and lettuce wraps are accompanied by popular Korean liquors, which is perfect for those looking for quick, late night eats. In talking with the restaurant owner, the menu will be changing frequently to reflect the seasons and current culinary trends in Korea. Although the menu will change, the size will remain the same. I met up with some friends last week and we happily ate our way through practically the entire menu! 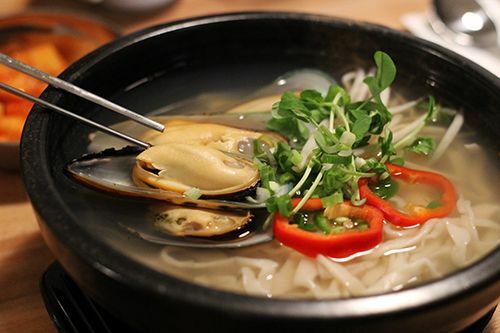 The night started with the Mussel Kalguksu, which features fresh hand-cut noodles ($13). Our thickly sliced noodles were soft with a slight bite and sat in a seafood broth with mussels, spicy peppers, and a handful of herbs. The clear broth had a pleasant briny depth and a slight kick of heat which I enjoyed. 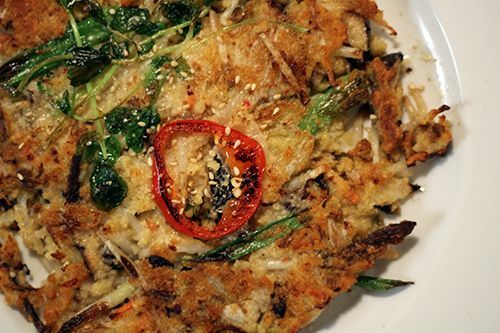 Next up was the BinDaeDduk ($8), a mung bean pancake with a medley of vegetables and kimchi cooked into it. I've never had this dish before, and the texture of it actually took me by surprise. I had expected the mungbeans to be ground into a fine flour to make the pancake, but it turns out the beans seemed to be lightly macerated, giving the pancake a crumbly texture. The flavours were there, but I didn't quite love the texture. One of my favourite Korean street eats is Ddukbokki, a chewy rice cake in stick form. Nongbu gets their rice cakes daily from a local source to ensure that they are fresh and have the proper texture. If they aren't fresh, they won't be on the menu. Those of you who love them as much as me are in luck, because Nongbu serves them up three different ways! We first ordered the Fried version ($7.50) where the ddukbokki is cut in half, then fried and coated in a sweet and spicy sauce similar to gochujang. This was my favourite ddukbokki of the meal as it was flavourful and the outer skin was fried to a crisp, but the interior remained soft and chewy. Delicious! 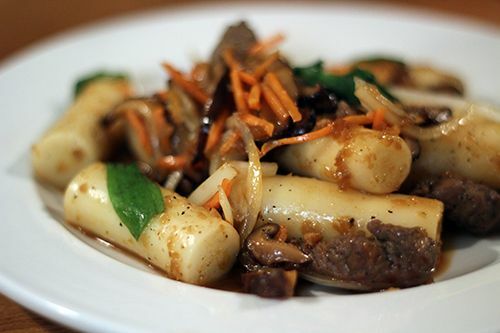 The Royal Ddukbokki ($11) features long rice cakes cooked in a sweet and savoury sauce with slices of beef and vegetables such as carrots, onion, and shiitake mushroom. The sweet and salty sauce reminded me of the soy based sauce used to cook bulgogi beef. The rice cakes were tender and this was another great dish! The next dish to the table was DwenJang Kalguksu ($11.50), another hand-cut noodle soup. This version utilized a Korean bean paste to make the broth, and the noodles were topped with ground pork, enoki mushrooms, and some chili peppers. 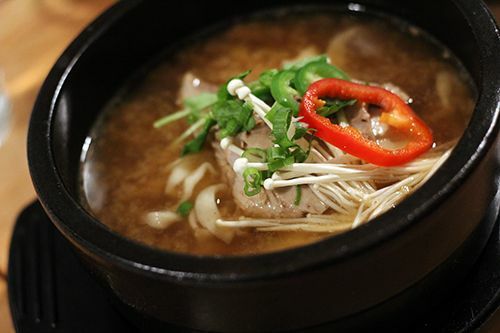 The broth had the same nutty flavour and cloudy appearance you would find in a miso soup. I personally preferred the Mussel version, but both were tasty soups that will easily fill you up. 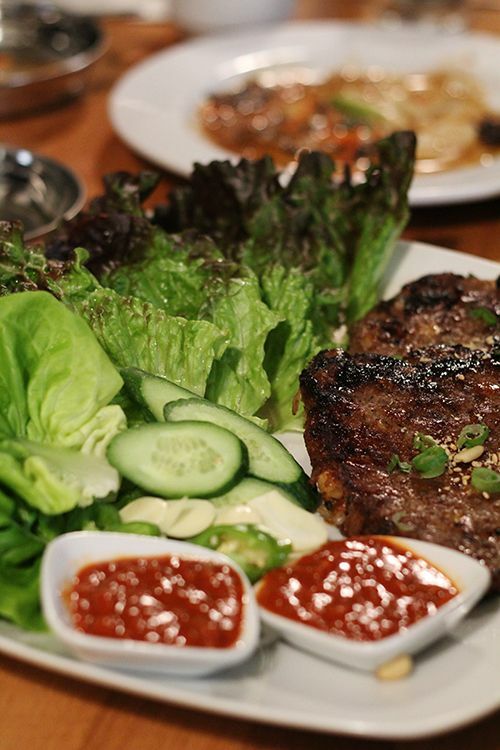 Nongbu offers a few different ssam (lettuce wrap) dishes, so of course we had to order one for the table. 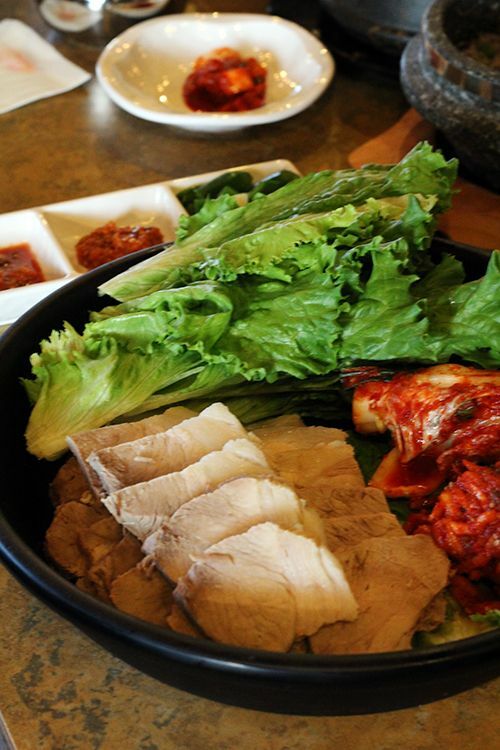 Three ssam options (Bo ssam, ddukgalbi ssam, tofu ssam) are available on the menu, all which come in individual or sharing portions. 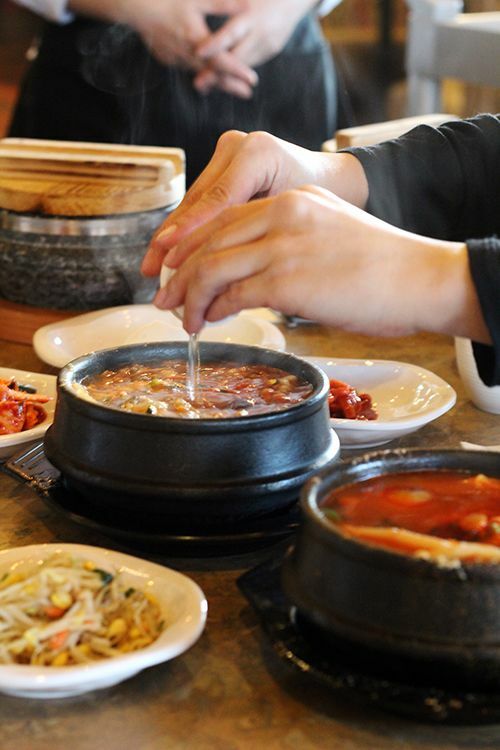 The dish is accompanied by a bowl of rice, a bowl of soup, and 5 banchan dishes on the side. It's definitely great value for what you get! We ordered the Ddukgalbi Ssam ($16 individual/$30 sharing) which featured two ribeye patties with rice cakes inside. The dish came with cucumber slices, jalapeno, garlic, spicy bean paste and both buttercrunch and red leaf lettuce for wrapping. The meat patties were so moist and flavourful, and the small ricecake pieces inside gave the wraps a chewy texture from time to time. I really enjoyed this one and would easily order it again. Kimbap (Korean sushi rolls) is another one of my favourite Korean street eats, and Nongbu offers them as a plate of 5 on their menu ($6.25). Alternatively, you can add one kimbap to any snack order for an additional $1.25 if you don't want to tackle a plate of them. 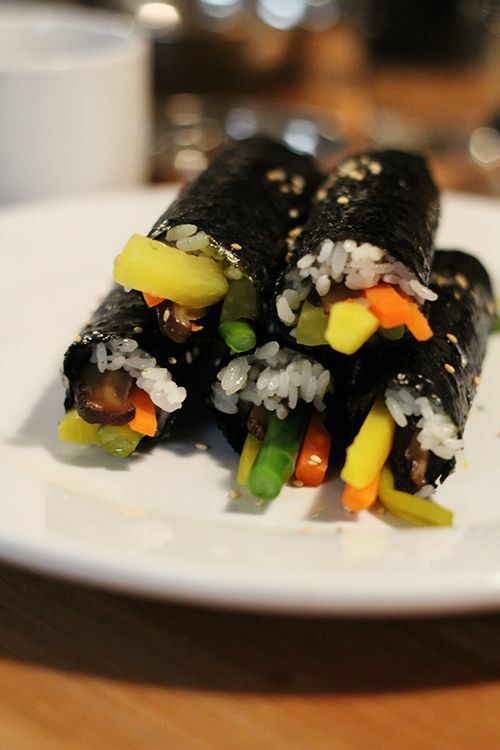 The kimbap on the menu can change daily depending on available ingredients, but it will always be a mix of vegetables and rice wrapped up in seaweed. Ours featured asparagus spears, pickled radish, carrots, and shiitake mushrooms served with a side of hot mustard sauce. The ingredients were fresh and the kimbap was a great snack to munch on. The Gemma Roll ($7.50) reminded me of a gigantic springroll, as it is an eggroll with beef and vegetables wrapped up inside. It's bursting with ingredients and topped with a sweet and savoury sauce - you want to eat this one quick before it gets soggy! 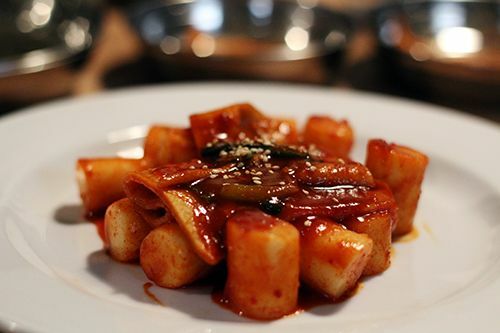 The last dish of the evening was the third of the ddukbokki offerings: the spicy ddukbokki! 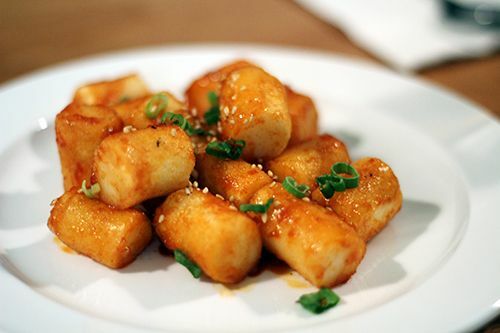 Short, chewy pieces of rice cake were coated in a dark, spicy sauce and topped with pieces of fish cake. This version is what I think of when it comes to ddukbokki purchased on the streets of Korea, so this is the most authentic of the three varieties. This plate was also delicious, but if I had to rank the three duukobokki dishes we tried that evening, it would be: fried, spicy, then royal ddukbokki! After a very filling meal I couldn't pass up on dessert. Nongbu offers the well known Melona ice cream bars as well as a Pig Bar, which I had never tried before. The Pig Bar is made by Lotte and named based on the little pig on the packaging, which looks like Piglet from Winnie the Pooh. 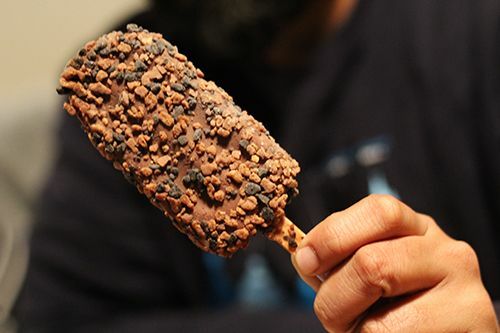 This vanilla ice cream bar has a strawberry centre and is coated in a thin layer of chocolate and crunchy chocolate bits. The flavour is very close to that of Neapolitan ice cream, and really reminded some of us at the table of the Meiji chocolate gummies. It was a nice cold treat to enjoy at the end of the meal that wasn't too sweet. 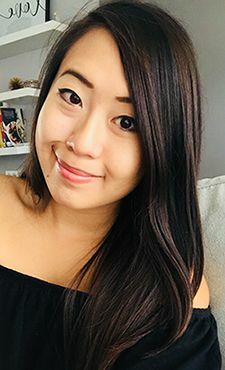 I'm really excited to have Nongbu join the Edmonton food scene, as it offers plates different from those you would typically find at Edmonton's Korean restaurants. It's a great casual spot to grab Korean snacks and drinks, and I can see it becoming very popular for the Friday and Saturday night crowds on Whyte Avenue. Prices are affordable and will run $15-$20 per person for a filling meal. I know that I'll definitely be back in the near future, and I can't wait to see what different plates they'll offer on their menu! If you're familiar with the Edmonton food truck scene, you'll know that Drift Food Truck makes a mean pork belly sandwich. I would actually say it's my favourite item served up by a food truck, so yes, it's pretty delicious. When I heard that Nevin and Kara Fenske, the minds behind Drift Food Truck, had secured a brick and mortar location last year I was absolutely ecstatic - pork belly sandwiches all the time for everyone! 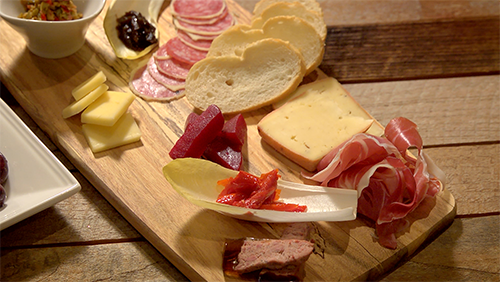 It's been months in the making, but the new Dovetail Delicatessen on vibrant 124 Street is finally open! Although it isn't the Drift Food Truck menu served out of a restaurant, fans of the truck will be happy to know that sandwiches are still the main offering on the menu. A daily roast is served in sandwich form, while a variety of salads, samosas, and dips are also available. Dovetail is open Monday through Friday from 1030 AM - 630 PM, allowing for those working downtown to grab lunch and residents in the area to stop by for a casual dinner. The space is bright, the decor is simple, and I love the vintage accents placed around the restaurant. 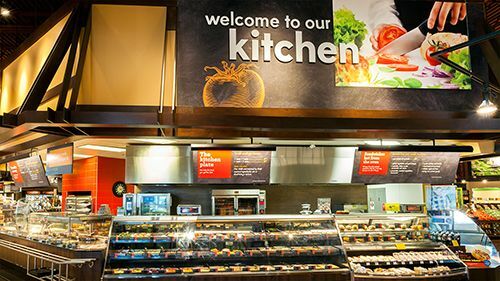 Whether you want to stay for your meal or grab something to go, you simply place your order up at the counter and you can watch your food be prepared in the open kitchen. 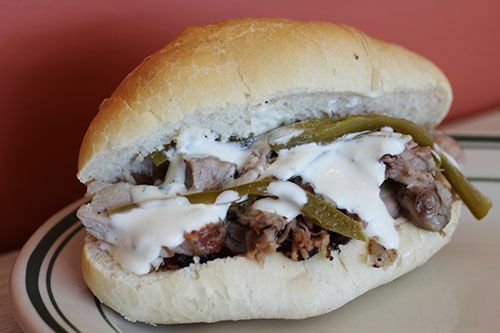 On the day of my visit the feature sandwich was a roast pork shoulder with garlic aioli and pickled jalapenos on a German bun ($8). The sandwich itself wasn't much to look at, but the combination was fantastic. The pork shoulder was moist and well-seasoned, while the tang from the aioli and jalapenos added a nice punch of flavour. I do wish the portion was a bit bigger, as the sandwich disappeared in no time and I was left wanting more - you definitely need something on the side for a substantial meal. 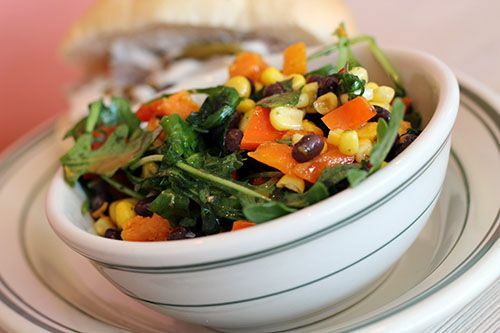 For a side I opted for the salad made with roasted butternut squash, corn, black bean, and arugula in an ancho chili and lime vinaigrette ($5). The salad was fresh and I enjoyed the contrast in textures and flavours between all the components. However, I was hoping to get more of a citrus tang from the vinaigrette as I couldn't quite find it. 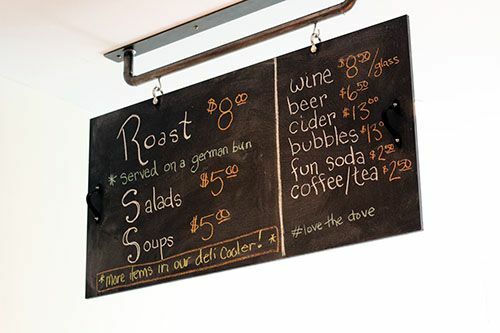 Sandwich shops are gaining in popularity and I'm sure Dovetail Deli is being welcomed to 124 Street with open arms. 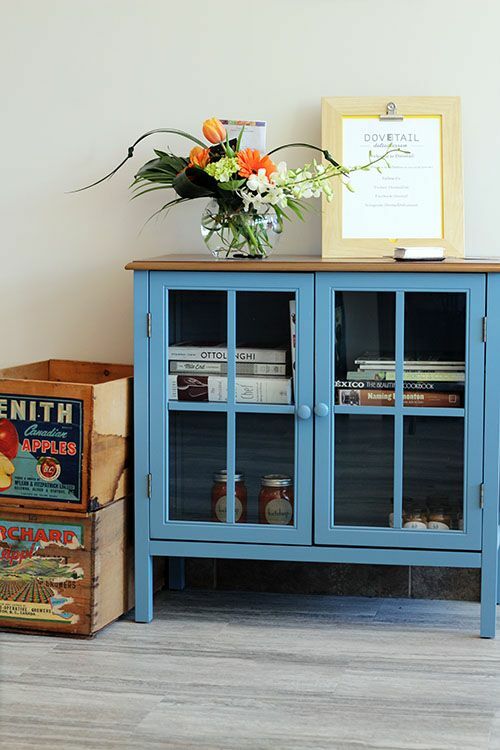 The casual, laid-back vibe is inviting and makes it an easy choice to stop at and grab a bite to eat throughout the day. Drift Food Truck is known for their great sandwich combinations and use of local ingredients, and Dovetail Delicatessen will be no different. Drift Food Truck won't be disappearing off the streets of Edmonton this year, but it's nice to know there is a place to go and grab a tasty sandwich during the colder months! Over the past couple months I've been waiting for The Black Pearl to open up - the signage taunted me everytime I made a visit down to 104 Street. Promises of a new restaurant dedicated to fresh seafood were too enticing, so I stopped by on opening day this past Friday. 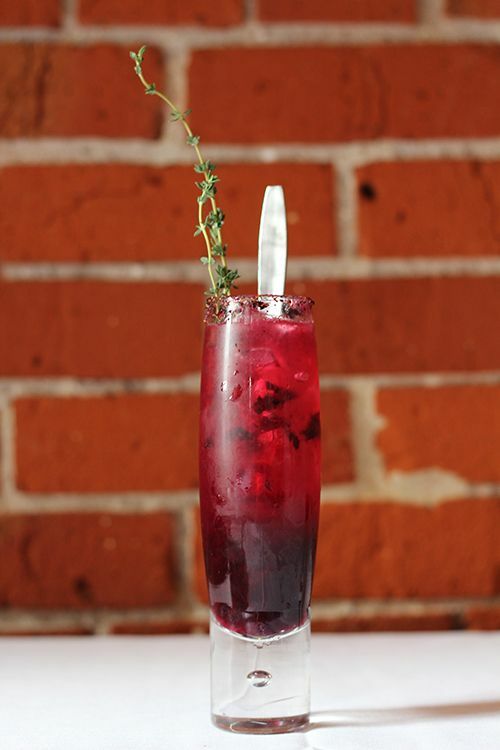 The Black Pearl is owned by the Crudo family behind Cafe Amore Bistro, a casual Italian restaurant located downtown that is known for their large portions and tasty pasta creations. By opening The Black Pearl the Crudo's are hoping to marry the casual atmosphere of Cafe Amore with traditionally upscale seafood dining. The Black Pearl has taken over the space previously occupied by Lit and the interior has been completely transformed. 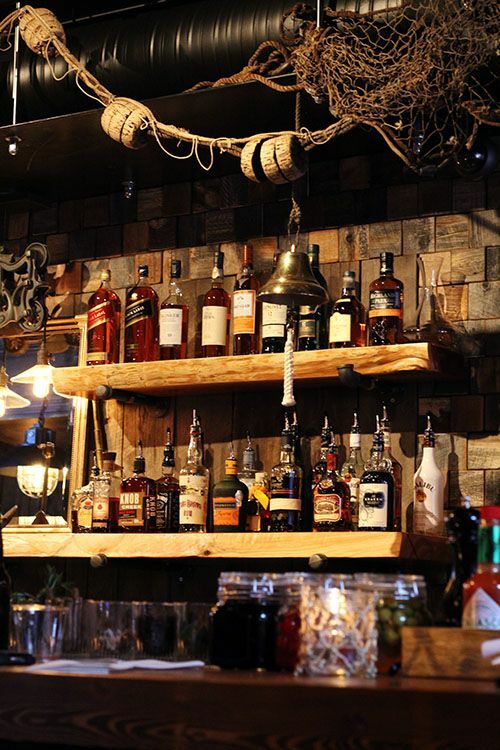 The lighting is dim with nautical accents, including wooden crabbing cages and fishing nets, which make it feel like you're dining in a pirate ship and sets the tone for a fun evening. A long bar with seating takes up about half the space in the restaurant, which makes the restaurant appear pretty small. However, the second floor of the restaurant allows guests to host private dinners for 10+ people. 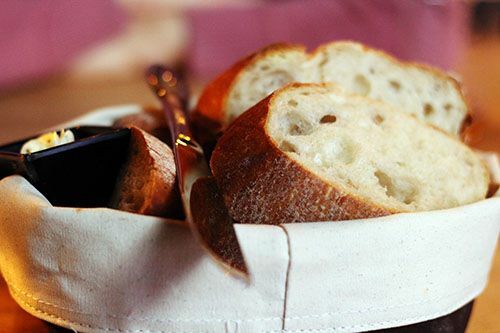 To start off our meal we were offered a basket of bread accompanied by a garlic & herb butter. The bread was soft and slightly warm, but the star of the basket was the butter. Fragrant herbs and a hint of tangy lemon was mixed into the butter and it was delicious. 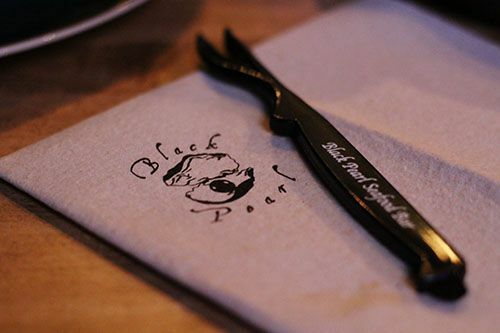 The plates at The Black Pearl are meant to be shared family style, so prepare to get your hands dirty and dig into your dining companions' plates! Our first dish of the evening was the Red Argentinian Shrimp & EC Scallop Tacos with Wasabi Cream ($20). 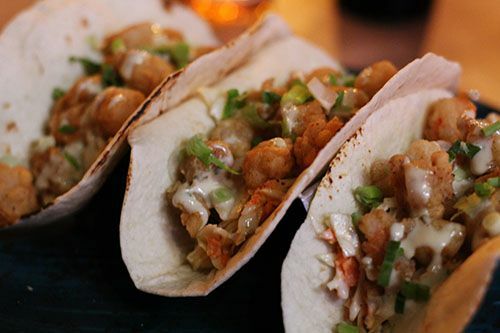 Served as a set of three on a soft tortilla, the deep fried shrimp and scallops brought a crisp crunch to the dish to contrast the crispy slaw. The sprinkling of green onion over top wasn't overpowering, but I found the wasabi cream to be the predominant flavour in the dish. The wasabi was particularly pungent in the last two bites, so much that I could feel it clearing my sinuses. The tacos were great, but I would definitely prefer for the cream to be lighter on the wasabi. Our second plate was the King & Dungeness Crab in a Crown Royal, chili, scallion, and ginger cream sauce ($36). It was a fair sized portion with King crab legs and Dungeness crab legs, claws and lump meat. The cream sauce was flavourful, coating every piece with a spicy kick. Our server brought along nutcrackers, a bucket for shells, and various tools to help extract the crab meat - one of which you get to take home as a souvenir. It's a neat little touch and part of making your visit memorable. 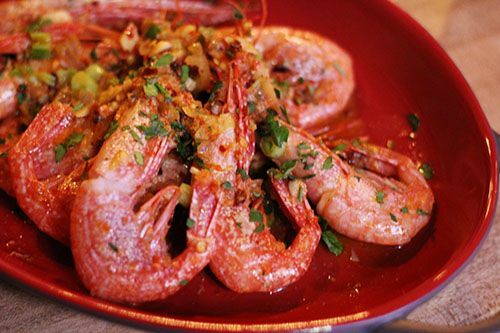 Our last dish of the evening was the BC Side Stripe Shrimp with heads on, sauteed with pimento, scallions, and shallots in garlic oil ($24). Side Stripe Shrimp are generally quite small, where the bodies are about pinky size, so it was nice to see 9 of them on the plate. This dish was incredibly flavourful and spicy, making me reach for my water in between each shrimp. Eating with the heads on can be intimidating, but you get the full flavour and all the rich tomalley. Our shrimp were also full of roe, which was another exciting find in the dish. Dining on opening night at a restaurant can be hit or miss, but dinner on Friday night at The Black Pearl was great. The seafood was fresh, hospitality was excellent and it was great to be able to enjoy seafood in a casual atmosphere. Due to the commitment to serving fresh seafood, the menu will change seasonally to reflect availability. An assortment of east and west coast oysters are also available to order by the half dozen ($18) and seafood platters featuring lobster, oysters, Dungeness crab, and Snow crab can be found on the menu as well. Despite being a casual restaurant, the prices are on par with other seafood restaurants and you can expect to be paying around $40-50 per person for a filling meal. Given the quality of the seafood and the fun atmosphere, it’s a great casual spot for seafood lovers to unwind and dine at! Back in my elementary school days my dad would often take me to Swiss Chalet after Saturday morning Chinese School. Our go-to spot was the location on 51st Ave and 97 Street and I enjoyed every single visit. Years have passed since those days, and on a recent drive by my old lunch spot I noticed it now housed a Korean restaurant. Of course I had to check it out! If you've dined at the Swiss Chalet in the past, walking into Tofu House might give you a bit of nostalgia and a flashback to old memories. The owners have taken out only the essentials (anything that explicitly says Swiss Chalet) and haven't changed anything else. The interior still looks and feels like a classic Swiss Chalet restaurant with the wood paneling and booth seating. The take-out room remains, as does the beverage station in the middle of the restaurant. It's a little bit strange, but hey, I'm here for the food. Some friends and I met for dinner last week and to start we had to try out the signature dish - tofu stew. On the menu there are 8 different types of tofu stews, each of which contains a different protein or a vegetarian option. We chose to go with the Seafood Tofu Stew ($13.75) and Kimchi Beef Tofu Stew ($13.75), both of which were brought to the table bubbling away. Each stew comes with a raw egg to be cracked into the boiling liquid and slowly cooked, and a large hot stone pot of brown rice with peas and almonds. 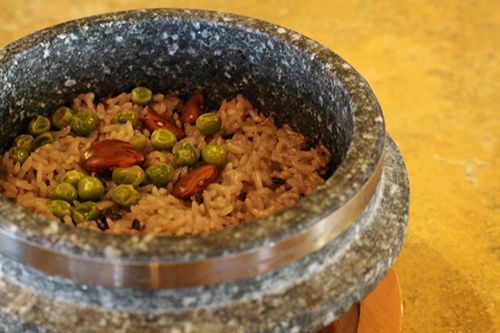 The Hot stone bowl continues to cook the rice while it is at your table, making the grains smoky and crunchy. To slow things down we were instructed by our waitress to add tea into the bowl so that our rice wouldn't get burnt to a crisp. I love when there are interactive components to dinner, so you bet I enjoyed the tofu stews. In addition to the shrimp, clams and oysters in the seafood version, we were surprised to find some crab legs in there too. Both stews were mildly spicy but flavourful and loaded with ingredients. It's a generous portion size for one person, so you can definitely considering sharing your stew! Being big fans of KFC, we also had to order the Fried Chicken ($21). 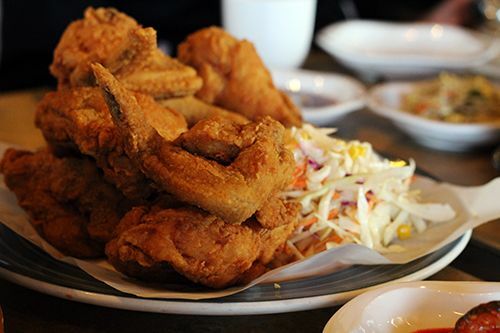 9 big pieces of chicken (wings, thighs, breasts) were served with a generous portion of slaw. The chicken can come plain or coated in a sweet and spicy sauce, but I always recommend ordering the sauce on the side to avoid soggy chicken. The fried chicken here was fantastic. The batter wasn't overly thick or too thin, which resulted in a crispy piece of chicken that didn't feel oily. The meat was moist and flavourful, and the sauce was sweet with a tiny kick of heat. I didn't care for the slaw as I felt it was pretty bland in comparison to the chicken, but it would be a refreshing bite between each piece of fried chicken. At Tofu House there is a section dedicated to specialty dishes that many Korean restaurants in the city don't have on their menus. 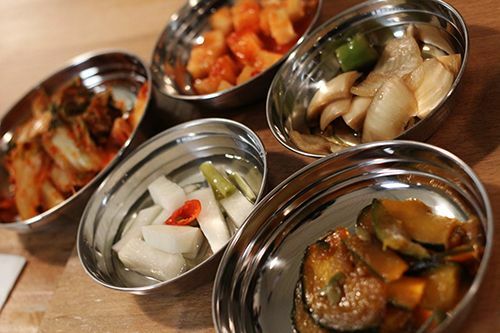 One of those dishes is Bossam ($29). 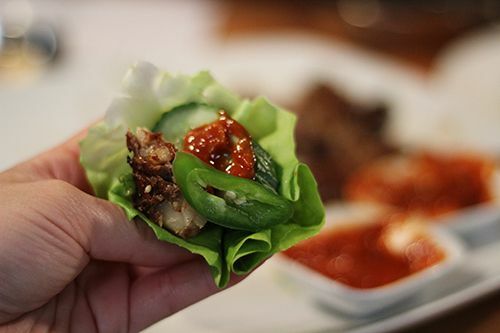 In Korean, bossam literally means "wrapped," so this dish usually features thinly sliced pork belly that can be wrapped inside a lettuce leaf with kimchi, ssamjang (spicy soybean paste), raw garlic, jalapenos, and pickled fermented shrimp. I love wraps of all sorts, and bossam is one of my favourite Korean dishes because you can customize your wrap to your liking, and it is so easy to put together. The ingredients in the dish were fresh, the pork belly was tender and the kimchi was flavourful. It's great to see another Korean restaurant opening in the south end of Edmonton. The menu is small, but it makes sense since Tofu House is more focused on one type of Korean dish. The food was tasty and the prices were affordable, but I think I would visit this restaurant with bigger groups. 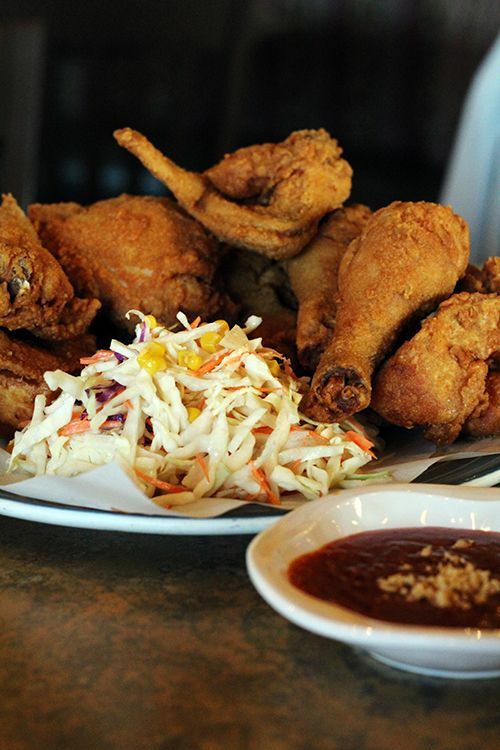 Given the larger portion sizes, it feels like a lot of the dishes are meant for sharing. With a bigger group of people you can order more and taste a wider variety of dishes. Great company + lots of food = win-win! If you're in the area, stop by and let me know what you think! Ever since the Edmonton International Airport started to offer direct flights to Iceland via Icelandair, I've been itching to travel there. With my busy schedule I haven't had the opportunity to visit yet, but if you're like me you're in luck, because Iceland is coming to Edmonton this weekend! 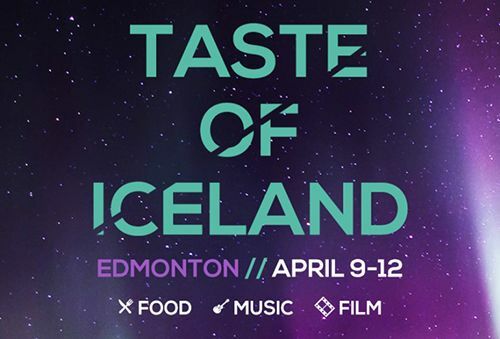 Taste of Iceland is back in Edmonton from April 9-12 to celebrate Icelandic culture through food, music, and film. Hosted by Iceland Naturally, this cultural event is a great way to get a taste of what life in Iceland is all about. I'm all about the food, but if you have time this weekend you should check out the free concert (Saturday) and film screenings (Sunday) going on! 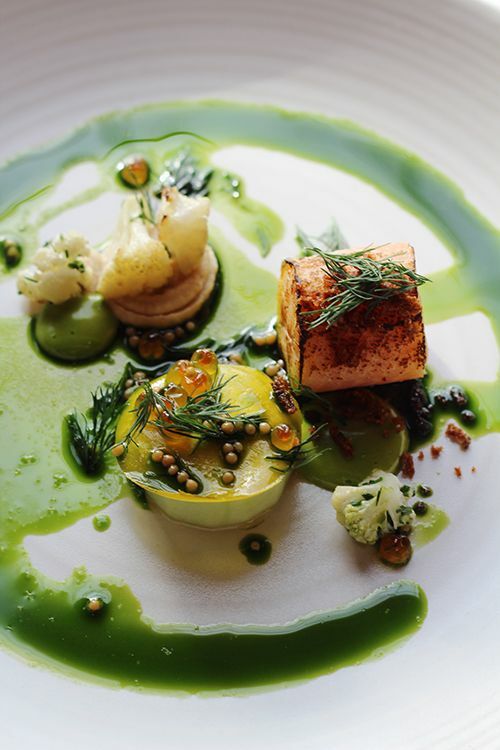 In collaboration with Chef Shonn Oborowsky at Characters, Chef Viktor Örn Andrésson has put together a four course menu for $79 to showcase traditional Icelandic ingredients with a contemporary twist. Chef Viktor is the head chef at Blue Lagoon's LAVA Restaurant, and was crowned the 2014 Nordic Chef of the Year. That's a huge title to hold and it's pretty exciting to have him here in Edmonton. The dishes available this weekend feature ingredients flown in from Iceland, and Chef Viktor's culinary talents are apparent in each dish. The first course on the menu features a lemon cured Icelandic Arctic Char served with roe, cauliflower two ways (pickled & pureed), horseradish, and dill (aioli & oil). The fish is fresh, cooked beautifully, and the dish is well seasoned. The flavours balance out one another and don't overpower the arctic char, making it a tasty start to a great meal. 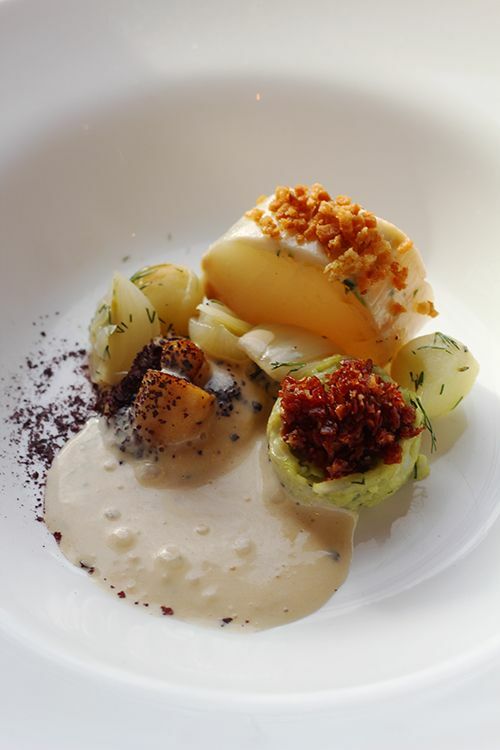 The second course is a sous vide Icelandic Cod topped with dried seaweed (known as "söl") from Stykkishólmur, a harbour town on the west coast of Iceland. Also on the plate is a lightly smoked langoustine salad, apple, parsnip, and pickled pearl onions. The seafood on the plate is fresh and the natural sweetness of the fish and langoustine really comes through. I loved the different textures in the dish and the flavours were spot on. Another fantastic dish. 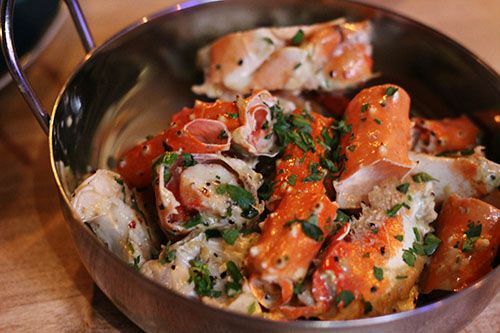 Fun fact: langoustine is considered the Icelandic lobster, as Iceland doesn't actually have large lobsters like we do! 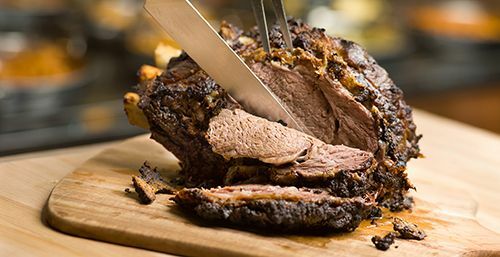 Iceland is known for it's free-range lamb, and the roasted rack of lamb in the third course does this protein justice. The meat is moist, tender, and flavoured with a combination of Icelandic herbs. 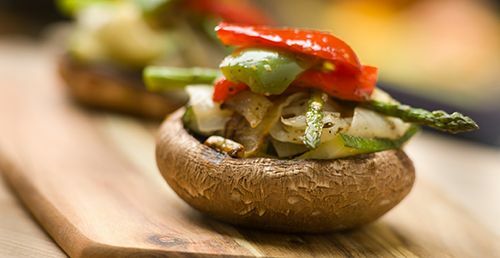 With some wild mushrooms, roasted carrots and a rich Madeira glaze, this main dish is another hit. To round off dinner is a dessert featuring Icelandic Omnom Chocolate and Viking Skyr. Skyr is a low fat Icelandic milk product similar to that of cheese and yogurt, so I was really interested to see how it would be used. The dessert is an almond and marzipan cake with hazelnuts, served with raspberry and skyr mousse, chocolate toffee, and a spoon of skyr and lemon ice cream. 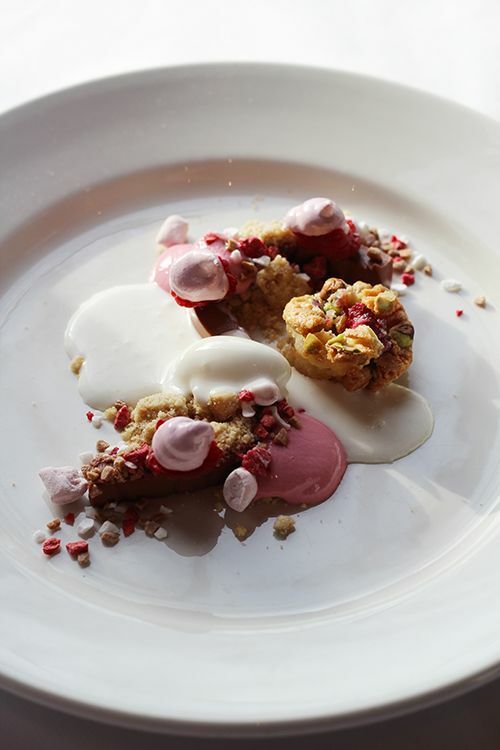 Raspberry is one of the only fruits that Iceland is able to grow in greenhouses, so Chef Viktor really wanted to use it as a component in the dessert. I loved that it wasn't too heavy or overly sweet, and the fresh and dried raspberries added some natural sweet and tangy notes. At $79 for four stellar courses, its a very reasonable price to be dining at Characters and getting a taste of a one-of-a-kind menu. If you have the time this weekend definitely stop by for a meal! And if you're a cocktail fan, the Viktolicious cocktail features Reyka Vodka, which is distilled in Iceland using Arctic spring water and filtered through lava rocks. So neat! A huge thanks to Iceland Naturally and Characters for the invite to check out the menu - see you when I'm in Iceland! Disclaimer: as this was a media preview event, views expressed in this post are solely mine. I was not expected to feature this restaurant on my blog, nor obligated to do so. This post is 100% my opinion, and as always, my priority is to you, the reader, to present an unbiased, thorough review. At the end of the first underground dinner hosted by The Salt Room, I was already checking my schedule and booking my spot for the second dinner. It was that good. This time around Chef Tony Krause decided to host two dinners with the same menu to accommodate his booking requests and allow for more people to experience his prix fixe menu. This time around the menu was set at $70 per person, with optional wine pairings (3 glasses) for an additional $30. Although advertised as a 5 course dinner, Chef Tony likes to throw in a couple of extras, one of which was an amuse bouche. 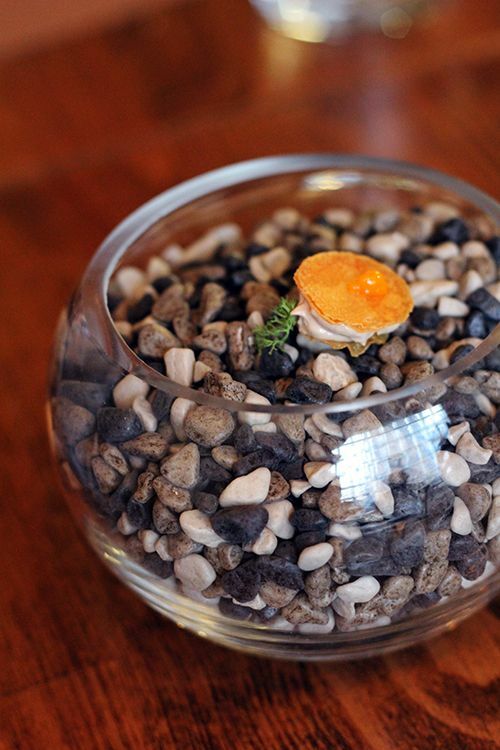 To start off the evening an amuse with components from chicken, seabuckthorn and lichen sat delicately upon a bed of rocks. A flavourful chicken heart mousse was served between two potato crisps, dotted with seabuckthorn berry jelly and served with a small sprig of fresh reindeer lichen. The different combination of textures and flavours was fantastic. What a great start to the meal. Next up was the bread course, but I didn't think anything would be able to top the combination of bread and butter we had been served at the previous dinner. Wrong. 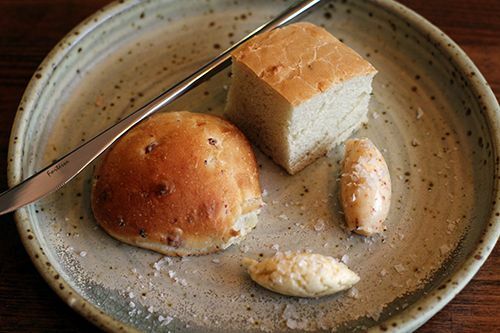 Our plates presented a bacon and onion bun and green cardamom and juniper branch focaccia. The bread was accompanied by a quenelle of onion butter and brown butter, each topped with a sprinkling of maldon salt. Both breads were pillowy soft, but the bacon and onion bun was my favourite…who wouldn't love bread laced with chunks of bacon? Both butters on the plate were unique, adding an extra dimension of complexity to each bite of bread. 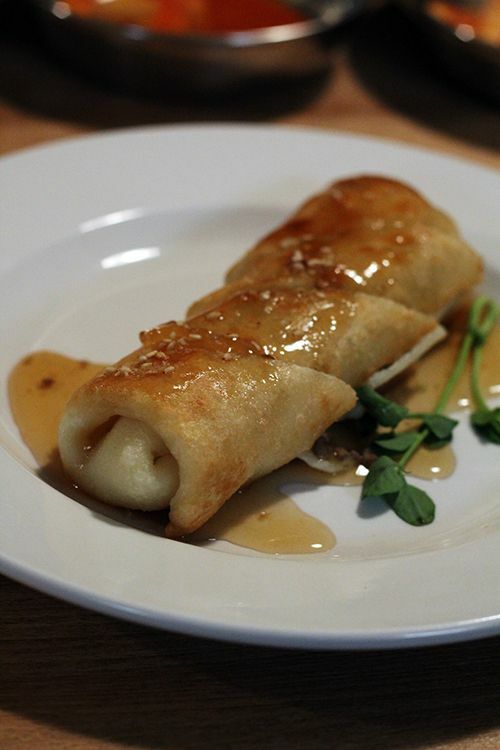 Given that it was April Fool's Day, Chef Tony made sure to include a couple unexpected twists in this dinner. 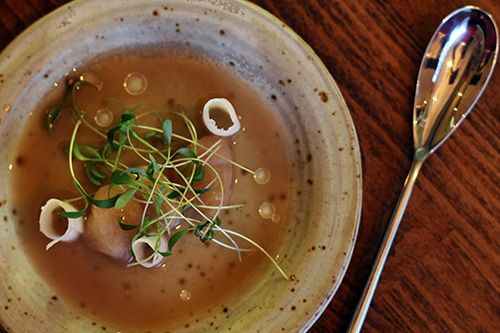 Our second course featured scallop jerky in a one week old fermented turnip juice broth, served with shaved poached turnip and topped with cilantro microgreens. 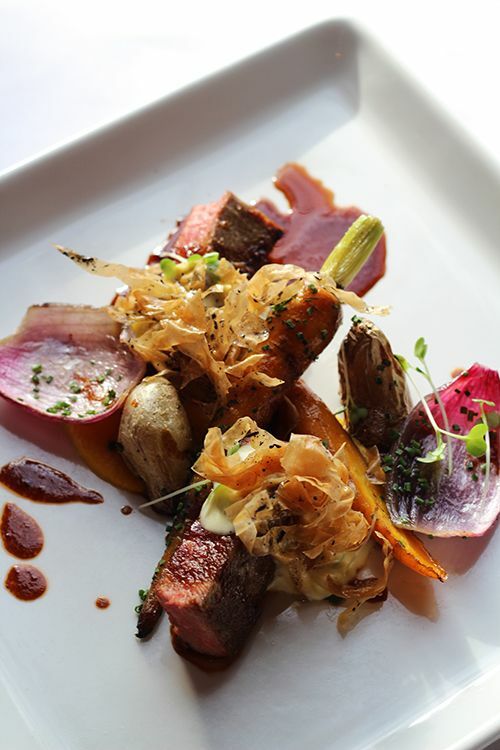 If there's one thing you can expect from Chef Tony, it's strong umami flavours in his cooking. The turnip broth was just that - stinky fermented juice with strong bitter, sour, and savoury notes. With a couple dots of canola oil to cut the acidity, I enjoyed the broth. The scallop jerky was dried to a gummy, sticky texture, similar to that of a jujube. Although I can appreciate the techniques utilized to create the jerky, jujubes just aren't my thing (I hate them getting stuck to my teeth!) and I personally prefer fresh or seared scallops. Course number three was plated beautifully, making me think of the warm Spring weather to come. 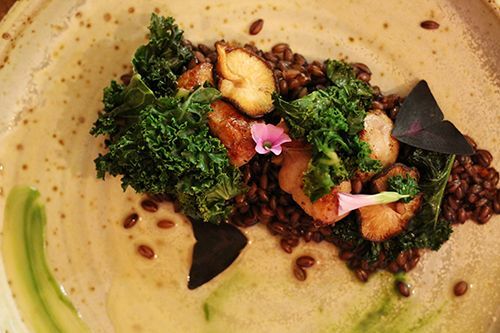 Veal sweetbreads (thyroid) were presented alongside wilted kale, charred shiitake mushrooms, and fresh oxalis flowers. All of this sat on a bed of black barley cooked with bacon, and the dish sat in a bay leaf & whey beurre blanc finished with fresh kale juice. The sweetbreads were cooked beautifully tender, and I loved the chew the barley had to it. Savoury, sweet, rich and acidic, there was so much going on, but all the components worked together harmoniously. Our fourth course was titled "Flavours of Onion," so I didn't expect to see a pasta course. Housemade tubular pasta had been infused with French onion soup. 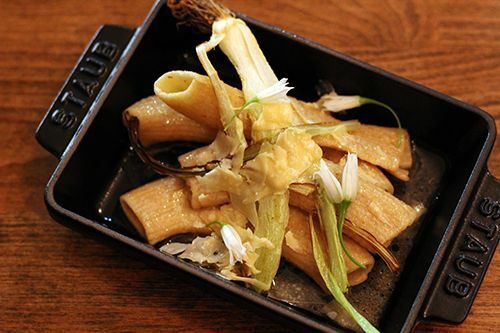 and served with charred wild onions and their blossoms sourced from MoNa Food. Each component had a different intensity of onion flavour, with the blossoms being the strongest of the three components. Topped with some shaved Sylvan Star Old Grizzly Gouda, this was a strong finish to the main courses. The dessert that evening was a work of art, featuring flavours of chocolate, banana, pecan and calamondin. 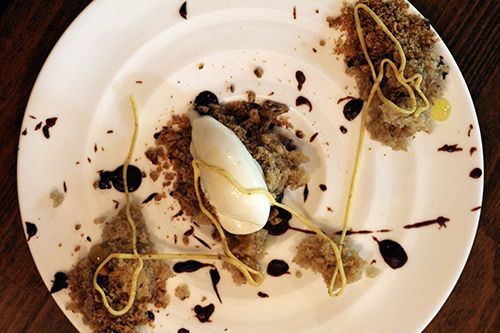 Chocolate cream had been splattered on the plate Jackson Pollock style, and three small portions of light banana cake were topped with pecan shortbread crumble, brown butter strings, and calamansi fluid gel. The cake in the middle featured a quenelle of an amazing housemade banana gelato. To make the calamansi fluid gel, Chef Tony used previously self grown and harvested calamansi oranges preserved in salt for one year, which gave this dessert a fantastic salty-sweet combination. Once again, the components with their different textures and flavours worked together perfectly. 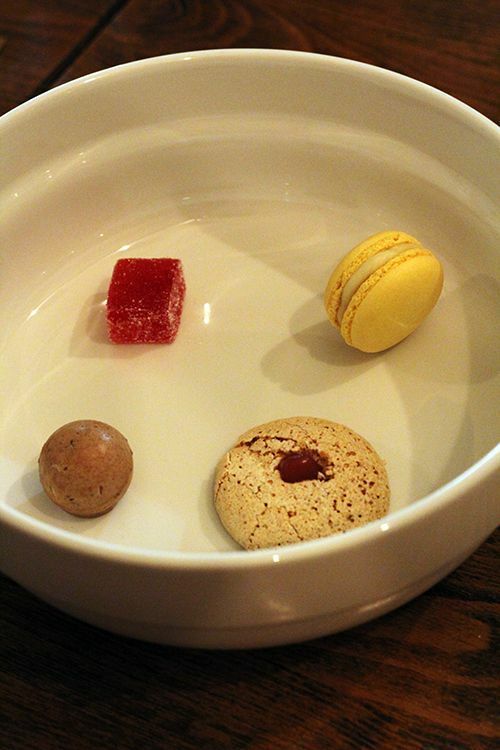 Rounding off the evening, Chef Tony presented us with a plate of petit fours. A mint mojito macaron, frozen chocolate parfait, smoked paprika wildberry pavlova, and wild sour cherry gummmy sat daintily in the dishes, waiting to be eaten. Each either had strong (macaron, gummy) or subtle (pavlova, parfait) flavour, and I made sure to savour each one. Chef Tony's underground dinners really showcase his skills and passion for locally sourced ingredients and nose-to-tail dining. For the upcoming dinners in April Chef Tony is currently sitting at a waitlist of 50+ people, so if you're interested definitely shoot him an email (antonykrause[at]gmail[dot]com) and wait patiently. If you don't want to wait, swing by Mother's Market Friday thru Sunday to try out his menu. The items change weekly, so there's always something new to try. I'm still waiting for the day I can try his charcuterie - set to be ready in a couple weeks! What if I told you that you could have restaurant-quality, Instagram-worthy meals in the comfort of your own home with little to no effort? You would think I was crazy. Maybe I am, but Sobeys is changing up the grocery shopping experience so that you can enjoy luxurious meals at home. Last month Sobeys Newcastle (16943 127 Street) hosted a pop-up dining experience for community members in Northwest Edmonton. The guests had been invited to what they believed was a five course menu preview for "Fresh Market Bistro," an upcoming restaurant set to open in North Edmonton. The 25 special guests got to enjoy charcuterie, butternut squash soup, salmon, prime rib, and a selection of fine Italian pastries. At the end of the event it was revealed that the food on the menu that evening was actually from the take-out kitchen and fresh market at Sobeys Newcastle, where everything is prepared fresh daily. What a creative way to make an announcement to the community in Northwest Edmonton! Take a look at the recap video below. Isn't that awesome? I think it is great that Sobeys is taking grocery shopping in a new direction, where fresh, high-quality gourmet food is available for take-out. Sobeys Newcastle opened in June of 2014 as the first new concept Sobeys in Edmonton. Items are prepared fresh daily and sold for takeout, which would be perfect on evenings where you're heading home late from work or if you don't have time to prepare lunch for the next day. To celebrate the launch of the new kitchen and market, Sobeys Newcastle has kindly offered to give one of my readers a $100 gift card to shop and check out all the ready-made meals! 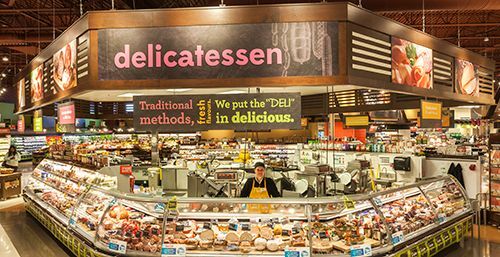 I'm so excited to check out the store for myself, and I'll be heading straight to the deli to see which cheeses they have brought in from around the world. See below for all the giveaway details! This giveaway is being held via Twitter. To enter, you must tweet the following: "See the #SobeysKitchenSurprise & enter to win a $100 GC to @Sobeys Newcastle from @littlmissandrea! #yegfood" Make sure to include a link back to this post. This giveaway is open to anyone 18+ years of age in Edmonton. You have until April 9 to enter and the winner will be selected by random and be contacted via email. Good luck!